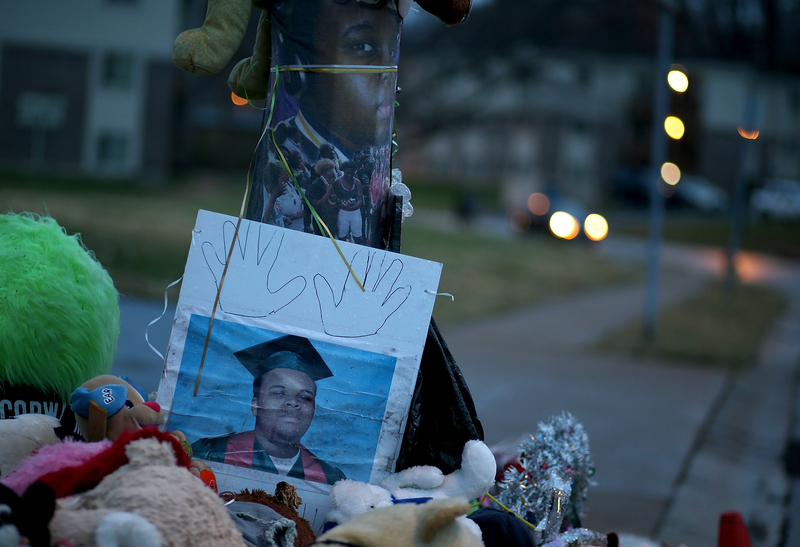 One year ago, the killing of Ferguson teen Michael Brown sparked a movement to address police brutality and racism against the black community. In the weeks that followed Brown's death, national news outlets and social media were flooded with his pictures and videos. But we didn't meet the kind, quiet, artistic teenager that his family and friends knew. We didn't hear much about his plans for entering college, or the recording studio he'd built from scratch at his grandmother's house. The world got to know him through the last, tragic three minutes of Michael Brown's life: from 12:01 p.m. when Officer Darren Wilson stopped Brown in the street to 12:04 p.m. when Wilson shot the teenager dead. Soon, Brown's final moments would be recounted alongside those of the many recent victims of police brutality and injustice in the black community. Brown's story — along with those of Sandra Bland, Tamir Rice, Eric Garner, Rekia Boyd, as well as other victims of alleged police brutality — would start a national conversation about police violence and set off the important #BlackLivesMatter movement. But, the people who have died are more than the hashtags tied to their names. They're more than the protests launched in their honor. They're more than their tragic last encounters with law enforcement officers. The victims' families have spoken emotionally about the people they lost. Brothers, sisters, and parents let the world know the young men and women whose final moments have so haunted us, many of them sharing photos and stories that told us a far deeper story of loss than the ones you might have seen in the media so far. One year after the Michael Brown shooting, these families would like you to know more about the people whose tragic deaths helped to launch the #BlackLivesMatter movement. Michael Brown: “He Was Just Mike Mike, Our First Son"
Michael was definitely a leader. He was a big brother, so he was a protector. He was the first grandson, so he was a provider to elderly people that needed help across the street, bringing in their groceries, very respectful. It was a real push for him to graduate high school. He kind of struggled. Coming from where Mike Mike grew up, it's very challenging and your mom has to stay on you because the drop out rate is higher than the graduation rate. [...] His mom said to him, "Okay. You've done the thing I really pushed for you to do so go ahead. Whatever you want to do, this is your summer to do that." With school plans already lined up, Brown decided to take the summer to pursue his real love: music. His family said that Brown had built a music studio at his grandmother's house and when he wasn't in class, he would spend hours writing and uploading new material. Michael Brown Sr. told CNN reporters more about Brown's personality: "He was funny, silly. He would make you laugh. Any problems that were going on or any situation, there wasn't nothing he couldn't solve. He'd bring people back together." On Aug. 9, 2014, Michael Brown was killed by Ferguson police officer Darren Wilson, just two days before his parents had planned to drop him off for his first day at college. The Department of Justice ended its investigation of Wilson, clearing him with no charges as prosecutors said they could not find evidence to disprove Wilson's claim that he shot at Brown out of fear for his own safety. Wilson claims Brown was advancing toward him, and said looking back on it now, he would not do anything differently. Sandra Bland: "Sandy Was The Light Of Our Family." She felt that what she was seeing in the 21st century, she shouldn't have been seeing as a millennial, if you can imagine. She was becoming very passionate about the Black Lives Matter movement and came to me — and everybody in the family at a certain point — and said, "I'm really struggling with this because I don’t agree with what’s going on and I have to find a way to channel that frustration so that it becomes productive." At the end of the day, she was someone’s daughter, she was somebody’s sister, she was somebody's aunt – she was so many things other than that snippet of information that you look at, whether it’s from the dashcam video or the jailhouse video that shows her as an inmate. As much as we loved her and lauded about her, she was all of our number one fan, as well. ... When we were involved in something, when we had successes those were her successes. My own daughter — I have a 3-year-old daughter — her birthday was in April and Sandy came with a bag full of gifts. She said, "I just couldn’t stop buying things." I have a nephew who is 8 and he is understanding this thing a little bit more than the younger ones. What's challenging for him [is that] my sister was a huge fan of his ... he plays little league football. She was always the loudest one. And the first thing he said to [his mom] was, "What about football season? She's not gonna be at my first game?" Cooper tells Bustle that while Bland’s family is still processing their loss, it helps to see that the world is finally getting to know Bland and all that she stood for. Bland died in a Texas jail cell after being arrested on charges of assaulting a police officer after she was pulled over by Officer Brian Encinia for failing to signal a lane change. Her death was ruled a suicide, but Bland's family has filed a wrongful death lawsuit against the officer, the Waller County sheriff's office, and the Texas Department of Public Safety. Encinia is on administrative leave and has not been able to be reached for comment, the Waller County lawyer said he would file a response soon but that he would vigorously defend the case, and the Department of Public Safety declined to comment on pending litigation. Tamir Rice: "He Was My Baby"
Tamir was a bright child. He had a promising future. He was very talented in all sports. He was just a wonderful kid. Everybody loved him. He was very helpful, very caring, very kind. And he was my baby. He's the youngest out of four. And he was my baby. Eric Garner, "A Father & Grandfather"
Eric Garner was a father of six and a grandfather. In 2014, he died after being held in a chokehold by NYPD officers; the medical examiner declared his death a homicide. Soon after, social justice activists launched peaceful protests and national attention that helped boost the #BlackLivesMatter movement into the spotlight. A grand jury declined to indict Officer Daniel Pantaleo on criminal charges. Pantaleo said it was never his intention to harm anyone. Still, little is known about Garner before the video of his death was made public. According to a New York Times report, Garner was a former Park's Department horticulturist, but a worsening asthma condition meant that Garner was unable to continue that work. And according to the Times, at the time of his death, Garner had become a new father again at the age of 43 — his youngest child was just three months old. In the years following Garner's death, his daughter Erica Garner has become an outspoken advocate for others who have died at the hands of police officers. And the family has launched the Garner Way Foundation to help call attention to cases of police brutality. Rekia Boyd: "Her Smile Was Contagious"
Rekia was love and laughter. Every time she walked into a room, she was laughing and joking. She made an entrance. She’d say, "Hey y'all!" when she walked into a room and always left the room with "love y'all" or "I love you." A lot of people loved Rekia. Even people who didn’t like her at first ended up loving her. She was an angel, truly. Anything you asked for, she did it. She was a joy to be around. Rekia didn’t have much, but she gave all that she had. Some of her friends were down on their luck — they might have gotten kicked out of their house or something — and ... I would tell Rekia not to be out on the street at night, so she'd come in with a friend at like 6 or 7 [pm]. Then, after it got late, she'd say to me, “I know it’s kinda late for so-and-so to get on the bus, so can they spend the night?” It took a while for me to catch on to what she was doing. But, I never really cared because growing up, we didn’t have anything. We've been thrown out of people’s homes and there's been nights when people wouldn't feed us. When you go through that, you have a heart for other people. I never turned any of her friends away. Following Boyd's shooting death, Sutton says that the family is focused on homeless teens, the way that their youngest sister showed them. Boyd was shot with an unregistered firearm by Dante Servin, an off-duty police detective while walking down an alley with her friends. Servin claimed he was justified because he thought a gun was raised — it turned out to be a cell phone. The officer was charged with involuntary manslaughter, but was found not guilty on all counts. After Rekia died, one of her girlfriends told me that Rekia wanted to start "Rekia's Haven," a place to help get homeless teens off the street and help them with jobs or getting their GED. I thought about it and I see now that’s why she was always bringing those kids to my house that didn’t have a place to stay. So, I’m committed to getting that work off the ground. Today, Ferguson residents — and the rest of the nation — are looking at how our communities have changed since Michael Brown's death. And indeed, as a nation, we've become more willing to call out racial injustice and address race-related violence. Still, these stories should remind us that the people who have lost their lives are more than hashtags and rallying points. One year after Ferguson, it's important to know the real men and women behind these tragic stories, so that we can truly continue to work in their honor.